If you’re looking for a stunning Tuscan town to explore in just one day, look no further than Siena. Not so crammed with art and architecture that it’s overwhelming, not so small that after a couple of hours you’re wondering what else there is to do, Siena is that Goldilocks-sized town that will forever cement your love for Tuscany. Read on to discover how to make the most of one day in Siena! The historic center of Siena is a UNESCO World Heritage Site. The major sights are clustered close together. So if you have one day to spend in Siena, you can see all the highlights without feeling rushed, soak in the medieval charm as you wander, and sample the local cuisine. Perfect! Arrive early in the morning, so you have the full day for your explorations, and plan to spend the night here after a late dinner and a post-dinner passeggiata through the lit streets. Start your one day in Siena with a walk around the historic Piazza del Campo. This gigantic shell-shaped piazza is Siena’s pride and joy, and one of the most magnificent town squares in all of Europe. In size, it is reminiscent of Seville’s Plaza de España. From the Piazza del Campo, streets fan out in all directions into the town. As with most other Italian squares, you’ll find lots of restaurants, cafes and shops on the perimeter. In the early morning, the piazza is not as crowded, and you can appreciate the palazzos in pleasing shades of rust, beige, and brown that line the vast medieval square. Gaze up at the Torre del Mangia (Bell Tower) as it rises up gracefully into the sky. At the time it was built, it was the tallest structure in Italy. Then admire the grand facade of the Palazzo Pubblico (Town Hall) right next to the Torre del Mangia. If you’re feeling energetic, you can climb to the top of the tower for panoramic views, but be warned, it’s a tight fit in parts. Pause at the Fonte Gaia (Fountain of Joy), originally built by Jacopo della Quercia. The sculptures currently at the fountain are replicas: the originals can be seen in the Santa Maria della Scala Musuem. The story goes that the citizens of Siena were overjoyed when water from a spring several miles away was brought to this site, hence the name! Twice each year, once in July and then again in August, the Piazza del Campo hosts the Palio di Siena, a famous horse race where jockeys race around a track created along the edges of the piazza. Before the race, a ceremonial pageant that celebrates the different contradas (districts) of Siena is held. 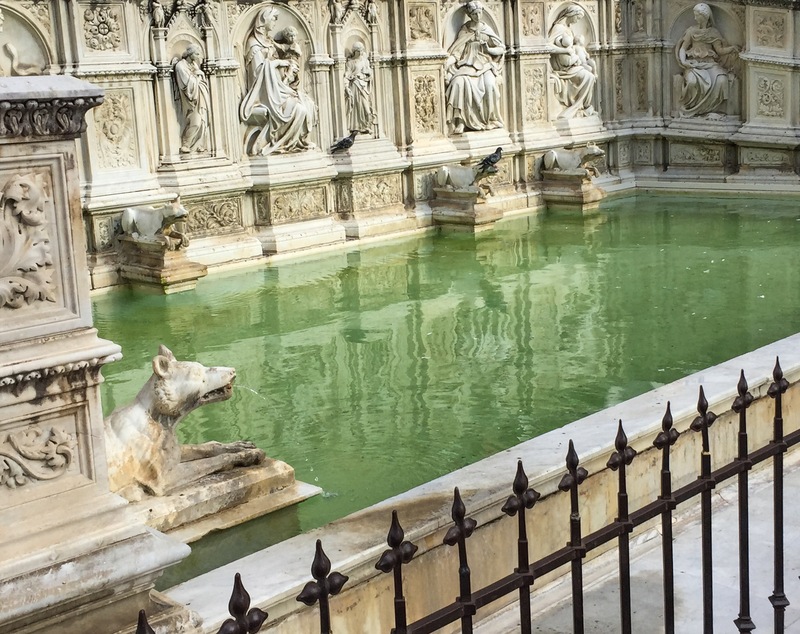 From the Piazza del Campo, a five-minute walk will bring you to the Duomo complex. 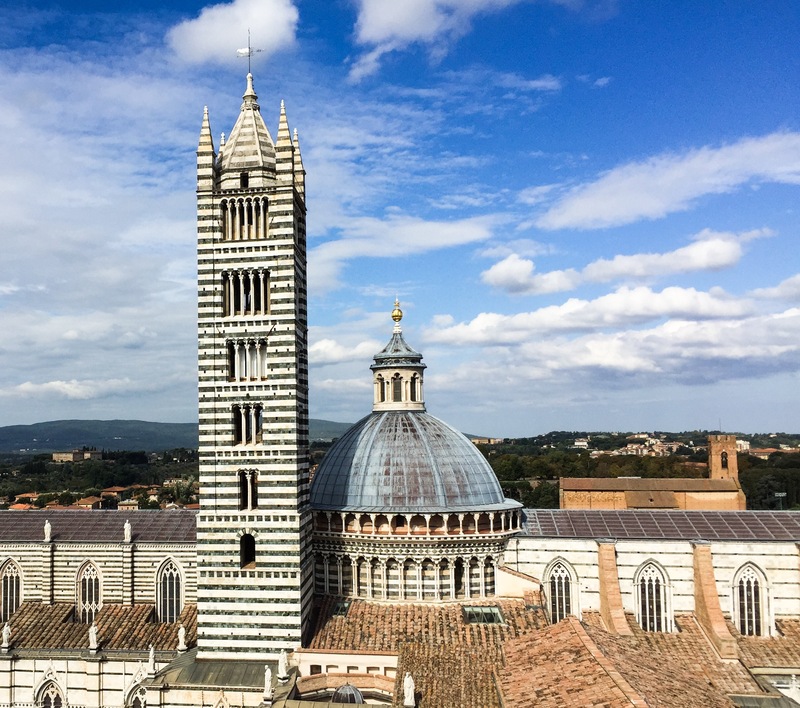 Here there are a number of sights you will want to explore, including Siena’s spectacular Duomo. At the Duomo complex, buy a combination pass that will allow you entrance to all the buildings in the complex. 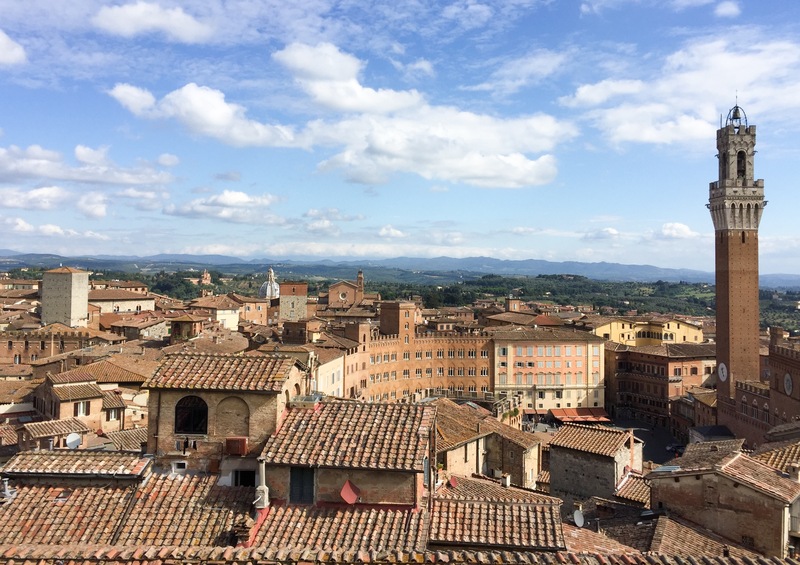 Then head to the Panorama dal Facciatone, to climb the spiral staircase to the top of the facade for gorgeous views of the Duomo, the rooftops of Siena and the surrounding countryside. Access to this viewpoint is via the Museo dell’Opera. You have limited time at the top, so be prepared to make good use of it, both for gawking at the views and taking photos. This site is actually the facade of a new, bigger cathedral extension that Siena had planned. Construction came to a stop when the Black Death destroyed the population of the town in the middle of the fourteenth century, and was never resumed. Spanning three floors, this museum houses many of the original works from the Duomo, including the stained glass rose window by di Buoninsegna, made to fill the oculus of the cathedral, and his altarpiece, Madonna and Child Enthroned. The colors in his works are bright and gorgeous. You will also see works by Pisano and Donatello as well as sculptures created by Jacopo della Quercia. The museum actually occupies the partially-completed New Cathedral. Don’t miss the Tapestry Room, with its gigantic hangings and beautiful fabrics. The Crypt has only come to light in the last twenty years. You can walk through the Crypt and view the frescoes, which are of astonishing quality, with well-preserved colors. You can also see the structural elements on the walls that are painted in rich colors. Emerging back into daylight once more, you can take a well-deserved break for a Tuscan lunch. Try ribollita, the famous Tuscan soup made with vegetables and beans in a rich broth and thickened with bread…yum! Or pasta with tartufo. After lunch, head back to the Duomo complex, where you’ll spend the afternoon at the Duomo itself. In a country filled with spectacular Duomos, the Duomo di Siena still managed to make me go weak in the knees when I first laid eyes on its stunning facade. A combination of Gothic, Romanesque, and Classical architecture, the facade has three portals. Mosaics adorn the three gables, and there is a large rose window below the center gable. The sculptures and architectural detail on the facade are stunning. The rest of the exterior is striped in striking dark green and white. The dome and the bell tower make for a perfect picture. The interior of the Duomo is equally impressive with dark green and white stripes on the walls and columns. The dome is done in a beautiful blue and gold pattern, with gold stars. The pulpit is made of Carrara marble and brilliantly painted with scenes from the life of Christ and the Last Judgment. The Duomo houses works by Donatello, Bernini and Michelangelo. The richly decorated Chapel of St. John the Baptist holds a bronze statue of St. John by Donatello and eight beautiful frescoes by Pinturicchio. The pièce de résistance in the interior of the Duomo is the marble mosaic floor, which is covered end to end with art work. Dozens of artists contributed to the floor art. The entire floor is uncovered only for a few weeks each year in the fall. The rest of the year, a few panels are still on display but the rest are covered to protect them. Don’t forget the Piccolomini Library! There is a door to the left of the Duomo as you enter. If you go through that door, you will be well rewarded. The ornate Piccolomini Library does not have any part of its walls or ceiling that is not covered in beautiful art. Also on display are beautiful illuminated choir books. The frescoes on the walls were painted by Pinturicchio and relate the story of Enea Piccolomini, who later became Pope Pius II. The frescoes, and the panels in the ceiling, are gorgeous. The detail is masterful, and the colors vivid. You will not want to leave the Library, so allow yourself at least an hour to appreciate its beauty and take a million photos. One of the most enjoyable things you can do in Siena is just walk its streets and narrow alleyways. The historic center is not open to traffic. The warm brown buildings are stunning, and each district (contrada) is decorated with its flag. Little shops and cafes and gelaterias beckon invitingly. You’ll come across little piazzas where you can stop for a bit and enjoy a glass of wine, and churches that you can admire as you walk by. Shop for olive oil, pasta, cheeses! For a special meal to end the perfect day in Siena, opt for an establishment that offers quality local favorites. Antica Osteria da Divo is highly rated and located not too far from the Duomo. You dine in ancient Etruscan rooms carved into the volcanic rock on which the hill town of Siena is built. La Taverna di San Giuseppe is another fine dining option. At either place, you should reserve your table in advance. The shoulder season months, April-May and September-October, are ideal, because the temperatures are relatively pleasant. In September, you will have the additional joy of seeing the entire floor of the Duomo uncovered. We spent a day in Siena in late September and the weather was perfect. It was not excessively crowded either. We stayed at the Villa del Sole, a bed-and-breakfast/boutique hotel just a five-minute walk from the Piazza del Campo. Our room was large and very comfortable, and we had views of the town as well as the Tuscan countryside. Most people visit Siena from Florence. We did, too. We took a direct bus, which is the most convenient option. It takes a little over an hour to get from Florence to Siena. From Rome, you can take either a train or a bus. The fast train takes a little less than three hours and you have one train change at Chiusi. The bus takes a little under four hours. So that’s my guide to Siena in one day! Have you visited this spectacular hill town in Tuscany yet? What did you like best about it? I’d love to read your thoughts in the comments below! If you haven’t yet visited, I do hope you will add it to your itinerary for your next trip to Italy. I have indeed, but a long time ago and barely remember any of this. This is a great guide Dhara. And your photos are fabulous. Thanks, Madhu! We were lucky to visit Siena on a beautiful autumn day, perfect for photographs! You will love Tuscany. And Siena is the quintessential medieval town you will enjoy exploring. I hope you get to visit soon! Thank you so much, Claire. I took a lot of photos at the Piccolomini Library and spent a loooong time staring at those murals! Italy is always a good idea! I agree, Tuscany is beautiful. Siena is one of those lovely laid-back hill towns that makes you want to live there! Never been to sienna. But looks like an amazing place to visit. Thanks for reading, Mayuri! You will love Siena’s medieval charm and magnificent Duomo when you do go! I love Siena! The Duomo is probably my favourite in the world, it’s just a beautiful work of art. The streets are amazing to walk around in too. A wonderful Italian city. Agreed! I fell in love with Siena’s charming streets and beautiful Duomo and can’t wait to return! I missed Tuscany towns during my Italy visit due to lack of time. I could only see Florence but always I wanted to for these kind of quaint towns with narrow streets and colorful houses. Siena has wonderful architectural buildings. It does indeed! I hope you get to visit on your next trip to Italy. I loved Siena! I do hope you get to go, Verena! Siena is an amazing Tuscan town. Its charming streets, gorgeous architecture and medieval atmosphere will capture your heart! Wow the art and architecture of this city is absolutely stunning! I really want to go here now. You will love Siena! I hope you get to visit soon! I hope you get to visit Siena! It is one of the prettiest Tuscan towns, and its Duomo is just magnificent! Siena looks absolutely amazing here, and what a great guide that you have put together to explore this Tuscany town. I’d love to visit the historic centre which is a UNESCO World Heritage Site, because it looks like it has lots of culture brimming in the region. Siena should definitely be on your list if you are planning to visit Tuscany, Nathan! The historic center is beautiful for wandering and the Duomo is so gorgeous! Sienna is one of my favorite towns in Italy. Living in the city does give one a feeling of being transported to medieval times. We were lucky enough to visit just before the Palio, and while we were unable to see the race, were treated to colorful parades almost every evening. The food in town was also spectacular. I still remember an amazing picci pasta dish we had from one of the small trattorias in town. The parades are supposed to be wonderful…you were fortunate to visit at a time when you could see them! Totally agree…Siena is a lovely town to visit. I would go back in a heartbeat! Italy and especially the region of Tuscany is so enchanting. Siena looks straight out of a fairy tale. We hope to explore more of Tuscany when we are there next. Till now our Italian exploration has been only restricted to places like Pisa, Florence, Venice, and Rome. Want to explore places like Sienna, Cinque Terre, etc. The Tuscan countryside is definitely worth exploring! So many stunning towns, and Siena is truly a gem. You will love it! Nive photos. Made me want to go there right now. Siena is so beautiful I would return in a jiffy if I could! It looks gorgeous there, and I love all of your beautiful photos! I’m a big fan of visiting old European churches and cathedrals. The architecture always takes my breath away. Looks like I’ll have to add Siena to my list of places I need to visit! Thanks for reading! Siena definitely deserves a spot on your wish list…it is a gorgeous town. One of my favorite towns in Italy!